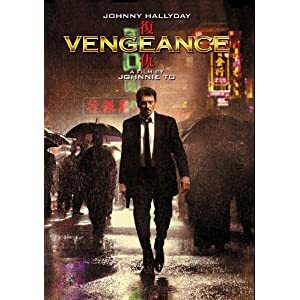 After a group of Chinese hitmen kill his daughter’s family, and put her in the hospital, French pop phenomenon Johnny Hallyday (check out his wikipedia listing if you’ve never heard of him) stalks through super-director Johnnie To’s beautiful and senseless action thriller like an aged French Mickey Rourke in a Mel Gibson revenge film. If the title doesn’t give it away, this is a film in line with Taken or Edge of Darkness – a film where the bad guys just don’t know who they messed with… or something like that. Basically a lot of people are going to die by the time the credits roll. There’s some hints at a Memento style memory loss situation going on with Hallyday’s character (a chef named Costello who happens to have a history of violence, though we never really find out why). At some point in his life he got shot in the head and the bullet is causing him to lose his memory. To this end he takes Polaroids of the people he meets and writes their names on them. This is a method he puts into use after he travels to Macau from France to tend to his daughter, and immediately hires a trio of assassins to assist him in this cause. The hired guns immediately track down the original assassins in Hong Kong (one of them got shot in the ear so obviously it’s a snap to locate him) and an impressively filmed shootout in a city park is the result. As this shootout reaches it’s climax, it’s clear that this is what To lives for – the plot and the characters are all dressing for his action scenes. A similarly dazzling shootout takes place in a dump later on in the film. Vengeance was nominated for the Golden Palm at the Cannes Film Festival as well as two Asian Film Awards but I found it a bit lackluster. The action scenes are impressive but I’ve seen better in other films – especially considering how many times our heroes get shot in this movie before they fall. At one point Costello gets shot in the chest and seems on the brink of death; instead, his friends pull the bullet out and he’s back on his feet no worse for the wear the next day. But details, details, the entire plot is clearly in the service of providing us with explosive action scenes, and this it does exceedingly well. If nothing else Hallyday is interesting to watch, and somehow manages to convey his starpower even to an American who had never heard of him before seeing this movie. Similarly, To knows his way around an action scene – for those who aren’t familiar with his canon, this is a good place to start. No user commented in " Movie Review: Vengeance "